SailKote Dry Lubricant: Competitive Sailors Use SailKote Dry Lubricant for Sails, Hulls, Rigging and Deck Hardware to Maximize Performance! 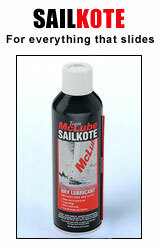 World class sailors across the globe from maxi-racers to sailboarders are enjoying the benefits of Sailkote's advanced dry lubrication technology. The same dry lubricant technology that has been developed for, and race proven by America's Cup Teams, Olympics Medalists, and One Design World Champions. Discover the difference Sailkote can make in your sailing performance and enjoyment. Just as the sailors of nearly every America's Cup syndicate have discovered, no boat should be sailing without the benefit of Sailkote.